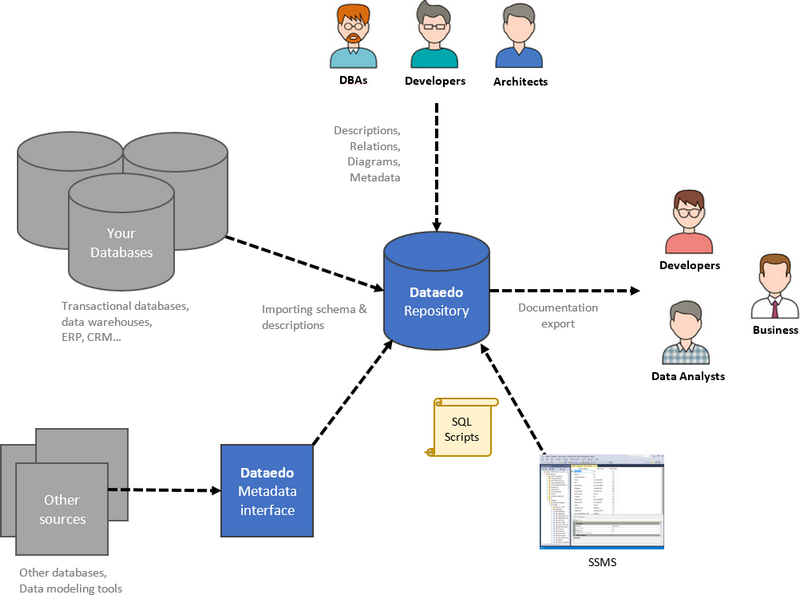 Dataedo holds its metadata in global shared repository. Dataedo repository is in fact plain documented and open SQL Server database installed in your environment. You can read and write data to it. Dataedo repository is not cloud based, you set it up in your environment that you control. We don't have access to any metadata you store. It is a secure as you make it. SQL Server database based open repository means you can write your own SQL scripts that manipulate metadata or use the ones published by us on our website. You can set up a number of repositories, each for different environment (dev, UAT, live) or version of your system. Each containing a number of connected databases. Use scripts or interfaces to copy between repositories. You can use repository database interfacing tables and import procedure to import or migrate metadata (database schema, descriptions, etc.) from external sources - Excel files, data modeling tools, legacy systems.